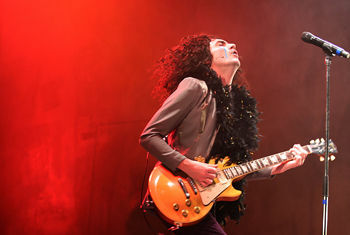 Following critical acclaim for his portrayal of Marc Bolan in the show’s highly successful runs at the New Wolsey Theatre, Ipswich in 2011 and the Belgrade Theatre, Coventry in 2012, Olivier Award winning West End star George Maguire (Sunny Afternoon) returns to lead the cast of 20th Century Boy. Featuring a new script by Nicky Graham and Colin Giffin, the production is directed by John Maher, and features more than 20 classic Bolan hits. 20th Century Boy is produced by GreatBrit Productions in association with Bolanic Productions. 20th Century Boy tells the life story of the legendary Bolan and his band T.Rex, exposing some of the myths and taking the audience on a tearful yet feel-good journey through Marc’s fascinating life which was cut short by a cruel twist of fate. Before his tragic death in 1977, a few days short of his 30th birthday, Bolan lived life at breakneck speed, creating a series of iconic images, a string of number one hits and an army of obsessive fans. 20th Century Boy is a glorious celebration of glam rock at its colourful best! Showcasing some of the greatest rock songs ever written, 20th Century Boy features many of Marc Bolan and T.Rex’s best-known iconic hits, including Ride a White Swan, Metal Guru, I Love to Boogie, 20th Century Boy and many more of their 70s classics.